Here’s what I love about food in Italy. It’s simple. Everything depends on the quality of the ingredients, but the food itself is often quite uncomplicated. The best fish I’ve ever eaten was just fish, olive oil and salt, the best tomato sauce is just tomatoes, olive oil and salt. You could add fresh lemon to the fish or basil to the tomato sauce but then you’re up to four ingredients, which means you’re getting fancy. When Nico came home from school today I asked him if he wanted a snack. He said yes and if I would cut him a slice of Lariano bread, he would make it himself. 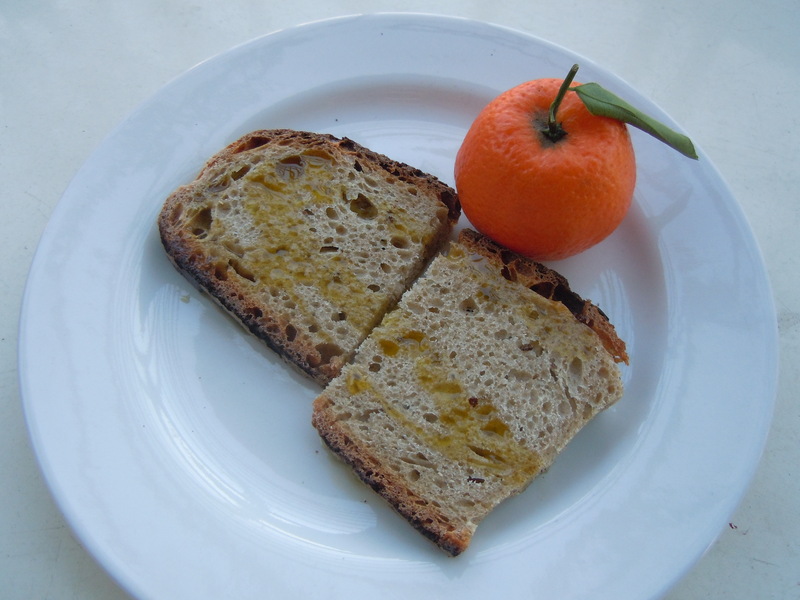 This is it: bread, olive oil (from our trees in Umbria, I should add – it’s still bright green and incredibly fruity and I want to drizzle it on everything I eat … but, I digress) and a Sicilian clementine. It reminds me of the simple snacks of my own childhood. My mother used to bake bread when I was very young and so I remember that fresh, yeasty smell of the bread and the aged Canadian cheddar she served with it. Other days she gave me apples and cheddar, or sometimes carrot sticks, raw green beans, peas in the pod. It was always something simple and never something from a package. Sometimes I think everything in my son’s life here in Italy is so completely different from my own childhood experiences in Canada. And then I realize it’s just the ingredients – he’s got olive oil and I had cheddar. The tradition of eating something fresh and homemade is reassuringly the same. I also feed my son very simply. I share what he eats each Wednesday, since his basic diet is unlike most kids his age. It helps that he doesn’t watch any broadcast television, only playing pbs and nick jr. games on the internet and watching Netflix. He doesn’t get exposed to any kids’ food advertising.